The Holiday Season is the pinnacle of traditions, relics and symbols. Everywhere you look you will find messages of peace, love and human compassion. We express them through our gifts, through our homes and through our communities. And as crafters, we tend to take our creative side to new heights, with inspirations to capture the holiday spirit through our own unique styles. So how do you personify your Christmas style? Truly, the Christmas tree is more than likely the star of this show. In all it’s glory and extravagance, gleaming as the centerpiece of your decorated holiday home. However, it is the commission of another ornamental expression that may provide the first glimpse into capturing your holiday theme. The Christmas wreath, traditionally displayed prominently and proudly on your front door, can say a lot about your style. In many cultures, Christmas wreaths are used in ceremonial events and carry with them much history and symbolism. They are typically made from evergreen branches which represent strength and wisdom, sustainable throughout the harsh winter months. And the circle shape, having no beginning and no end, denotes everlasting and spiritual life. Throughout the centuries, the Christmas wreath has been a prevalent household adoration, and we have come to enjoy customizing it to our own unique holiday themes and personas. This year, I had the pleasure of making my very own traditional Christmas wreath under the guidance of a well-known community florist, Stephanie Egly. Owner of Stephanie’s Secret Garden in Poolesville, MD (www.stephaniessecretgarden.com), Stephanie is a premier floral resource for weddings and events, known throughout the MD, VA and DC area for her beautiful one-of-a-kind specialty arrangements. She also attracts an abundance of DIY crafters to attend her fun-filled wreath-making and floral design workshops. 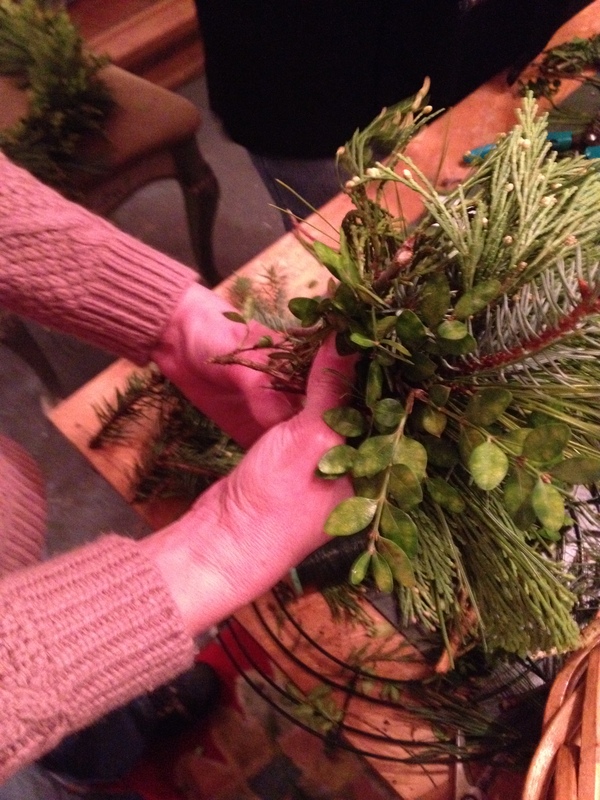 Thank you, Stephanie, for your hands-on tutorial and for helping us to add some holiday cheer to our homes this season! 1. Evergreen Branches. 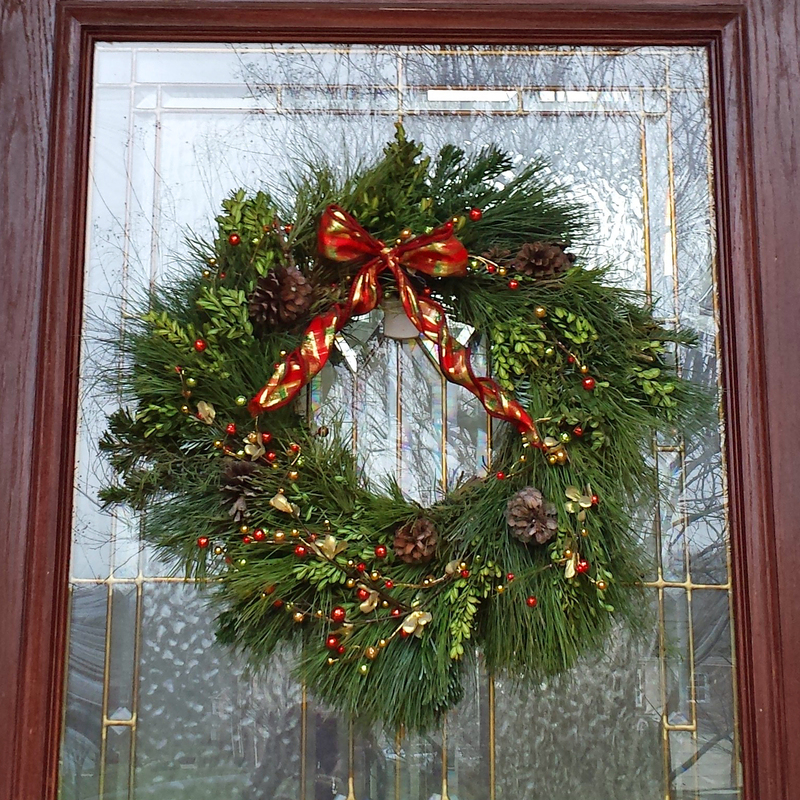 Use an assortment of evergreens with a variety of textures, colors and scents for added beauty to your wreath. Some that we used were: Spruce, White Pine, Cedar, Boxwood, Berried Juniper and Douglas Fir. 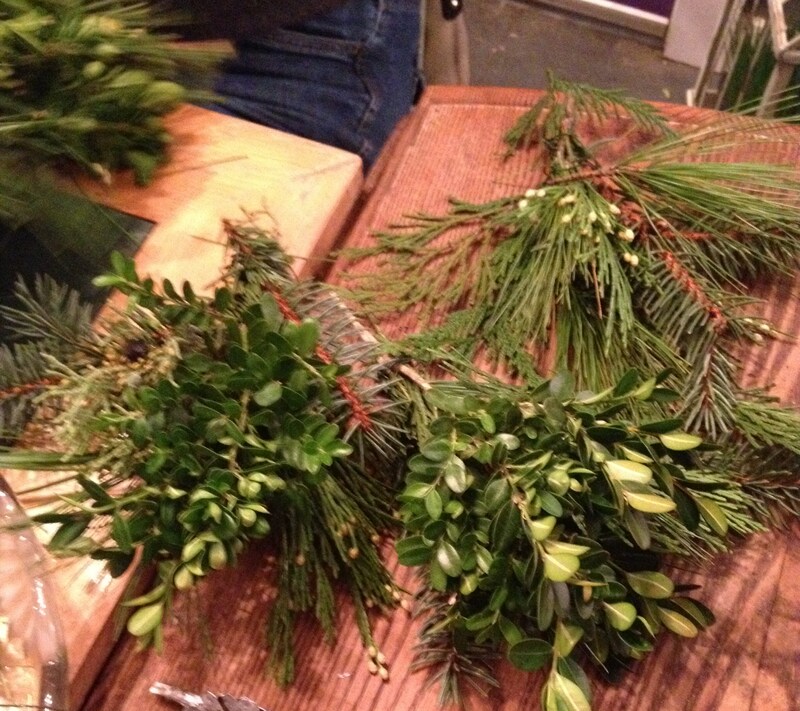 Using your floral shears, snip a variety of evergreen branches and arrange them to your liking into a handheld bunch. Tie your bunch together by wrapping a strand of floral wire around the base of the branches several times until secure. Repeat steps One and Two until you have enough bunches to go completely around your wire wreath form (usually about 9 – 12). Place one bunch onto your wire wreath form at an angle so that the branches point slightly outward. With the floral wire, weave the base of the bunch snuggly onto the wire form. Using this same technique, wire the next bunches on one at a time, layering them so that each bunch overlaps and hides the base and the wiring of the previous one. Once you have covered your entire wire form with branches, your wreath should have a nice full shape without any bare spots. Fill in bare spots accordingly with additional branches. Personalize your wreath! 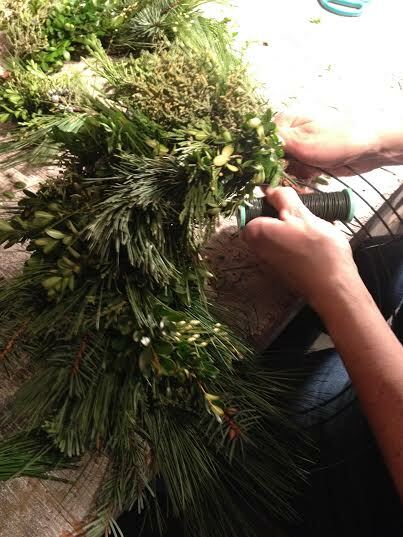 Add personal touches such as ribbon, pine cones and embellishments using a strong floral glue. If you can’t hang your masterpiece right away, keep it in a paper bag and store in a cool dry place. Enjoy your hand-made Christmas creation and may it bring joy and character to your home and family this holiday season!